I finished reading Plenty:One man, One Woman, and a Raucous Year of Eating Locally on Saturday. You may have heard of “the 100-mile diet.” Well, authors Alisa Smith and J.B. MacKinnon played a huge role in popularizing this way of local eating. The book covers the couple’s one year commitment to only eat foods that were sourced from within 100 miles of their Vancouver home, their purpose being to reduce the negative environmental impact created from shipping food across thousands of miles. The point is that a lot of fossil fuel is burned unnecessarily while bringing food from across the country, or across the planet, when most of us can live just fine on food found near our homes. Not to mention that we might actually know exactly what we’re eating, since eating locally doesn’t include eating anything processed (most processed food is made from ingredients that were sourced from god-knows-where)! It was interesting to me to read about the trials and tribulations of Alisa and James as they scrabbled together a healthy diet in the cool and rainy pacific northwest. It made me feel grateful that, if I ever do decide to start the 100-mile diet, I live in central Minnesota. It seems like there are not a whole lot of food staples that don’t grow within 100 miles of Minneapolis; notably, we have a lot of grains here, which was a problem for Alisa and James. Though this was interesting, what really fascinated me about this book was the thoughtfulness and the skill with which the authors lay down the story of their year. The chapters of the book are each named for a month, and Alisa and James (I know that it is not proper journalistic method to refer to authors by their first names, but I’m a blogger, not a journalist, and I almost feel like I know them after reading this book!) take turns writing about each month. Each chapter is preceded by a recipe and a pertinent quote. Both of the authors are professional journalists, so they know how to write in a way that is technically excellent. Being a description of a particular experiment, the book could have been a lot more dry than it was – trust me, I’ve read many a dry non-fiction. However, Plenty is filled with personal stories from the lives of James and Alissa. 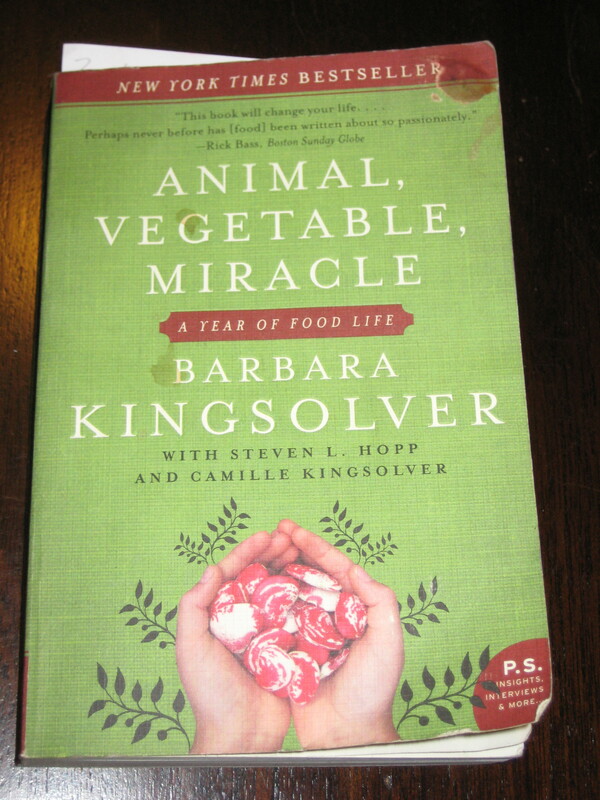 The stories and observations of the couple dovetail beautifully with the nuts and bolts of the diet to create a picture of how emotionally and spiritually connected humanity is with what we eat; and how far we have strayed from that connection. The trials and tribulations are interesting and, at times, instructive, but it is the amount of imagery and emotion in the book that makes it a pleasure to read. November in Minnesota doesn’t seem like the right time to completely dive in to a local foods lifestyle, but someday I hope to live this way, and I’m taking baby steps all the time. It will be extra challenging with my allergy-induced diet restrictions! In the meantime, Plenty is an inspiration for anyone that wants to feel closer to the earth, and to gain a better sense of how lucky we all are to be here.